As we are passing through the midway point of our RR projects, the tops are taking shape and character. As you know, good design usually involves some form of repetition. 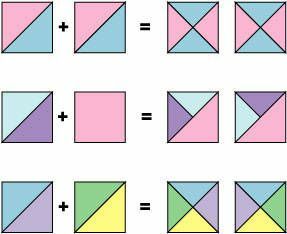 This month’s assignment of quarter-square triangles will echo April’s assignment of half-square triangles. Please do two sides in a size that befits the previous work. If you can repeat some fabric, do it. If you can include a little extra fabric for another round, add it. If you are feeling extra, go for the split quarter-square!